For Ray LaHood, former U.S. Secretary of Transportation, there was no sugarcoating the nation’s current transportation realities. 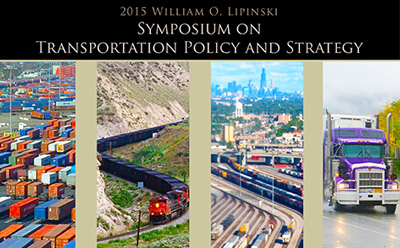 “We’re in a crisis, and the transportation program in this country is on life support,” LaHood told about 100 attendees at the 2015 William O. Lipinski Symposium on Transportation Policy and Strategy at Northwestern University on June 22. Roads and bridges across the country, he said, continue to deteriorate amid consistent federal inaction for infrastructure maintenance, and a “big pot of money,” is needed to remedy the nation’s transportation woes. LaHood called for legislators to raise the nation’s gas tax 10 cents per gallon and index it to the cost of living. “It’s a no brainer,” he said, acknowledging that current Congressional resistance to compromise leaves him with little optimism that such a solution will take shape in the near future. Amid this crisis, the daylong Lipinski Symposium, hosted by the Northwestern University Transportation Center, offered varied perspectives and promoted a solutions mindset for transportation and infrastructure improvements, exploring issues such as tolling, user fees, and public-private partnerships as a means for the both the nation and the Chicago region to remain economically competitive on a global scale. As the United States has slid from the global leader in infrastructure to now the 28th rated nation, LaHood urged attendees to become advocates and to push policy makers for funding. It was a message repeated throughout the day, as numerous speakers called attendees to be advocates for transportation’s pressing needs and infrastructure’s necessary improvements. Current U.S. Congressman Daniel Lipinski, son of the Lipinski Symposium namesake, provided a look into the present state of transportation issues in the nation’s capital. Lipinski, who serves on the Transportation Committee, reported rising interest among Congressional members to provide transportation solutions, but acknowledged that “raising the revenue” remains a significant barrier. “To get this done politically, you need to continue pushing this as a political issue,” Lipinski told the crowd. To sell the value of freight and transit to the nation and its governmental leaders, Joseph Schofer urged attendees to champion outcomes, quality of life, and the potential consequences of not having transportation services. “These are the things we have to work on together,” said Schofer, professor of civil and environmental engineering and associate dean at the McCormick School of Engineering and Applied Science. As other nations push money into infrastructure development, opening new airports, roadways and high-speed rail, the United States risks falling “further and further behind,” said Chicago Transit Authority president Dorval Carter, who was the former chief of staff for U.S. Department of Transportation Secretary Anthony Foxx. Though conversations around funding tend to be less collegial, Lipinski expressed hope that the federal government would soon act and, in particular, become more involved in transportation research. “That could accelerate the pace [of solutions],” he said. As tech giants like Google, Uber and Amazon continue entering the transportation scene in unexpected ways, there is accelerating hope that quality solutions might arrive in spite of continued federal inaction. Illinois Department of Transportation Secretary Randy Blankenhorn said using public money to leverage private investment could create broader opportunities for public-private partnerships and spur more reliable and sustainable funding options for infrastructure improvements, which he considers necessary to the nation’s global standing. During the symposium, DSC Logistics chairman and CEO Ann M. Drake received the David F. Schultz Award for Outstanding Public Service in Transportation and Infrastructure. The annual award, named in honor of the late David F. Schulz (1949-2007), the founding executive director of Northwestern University’s Infrastructure Technology Institute, recognizes individuals for technical or legislative innovation or public policy leadership in the fields of transportation or infrastructure. Since becoming DSC’s CEO in 1994, Drake has transformed her local family business into a national name and emerged a leading advocate for the logistics industry as well as a powerful force for women’s development in the supply chain field. Most notably, Drake founded AWESOME (Achieving Women’s Excellence in Supply Chain Operations, Management, and Education). In just three years, the organization has grown to include some 600 industry women, an annual symposium, and scholarships for female students.